I am a beginner scroll sawer and that is why i have enjoyed your site, Daily. 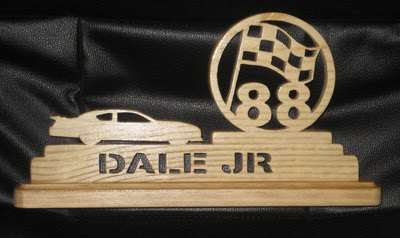 I found a site that i can print Gears then cut them with scroll saw... though you might be interested. Thanks Tanya, this gives me several ideas for future patterns. 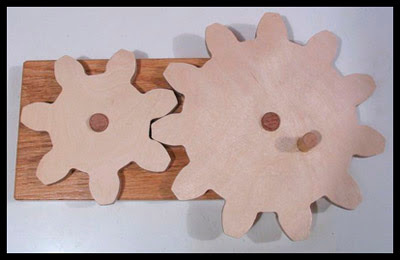 If any one uses this generator to design the gears for a scroll saw project and would like to share, email me a picture. Lydia, a frequent reader of The Scrollsaw Workshop emailed this photo of one of my patterns she cut. She modified it a little by scrolling the drivers name. Looks great to me. Post a comment below and say hi to Lydia. I thought these videos might be of some interest to anyone just getting started in woodworking. The guys over at finewoodworking.com put together a woodworking introduction series of videos. Here are the first four videos in the series. They do a pretty good job of going over the basics. Enjoy. If you are reading the email post please visit http://scrollsawworkshop.blogspot.com to view the videos.